“Attention passengers, we are ….” the driver’s voice trailed off. This was not the usual, but we do often “hold” at a station, never quite sure why (though we do remember one time when we threw, by mistake of course, our Metro Pass onto the tracks at Union Station and the Red Line was halted while the Metro staff manager went down on the tracks to retrieve it – we can still remember the announcement then “Delays on the Red Line in the direction of Silver Spring” as the manager handed me back my Metro pass, my head bowed in guilt), but I took the iPod ear phone out and waited. 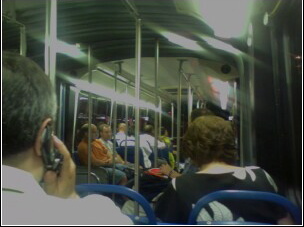 “Attention passengers,” the driver repeated, and it did sound like she was frustrated, but politely so. “All Blue Line trains will end at Arlington Cemetery due to an emergency situation, this train will end at Arlington Cemetery.” Well, that’s often the end of the line for some, looked like it would be end of the line for us. A few minutes later that was updated to the Pentagon. But that really would be the end of the line and that wasn’t even half way home. 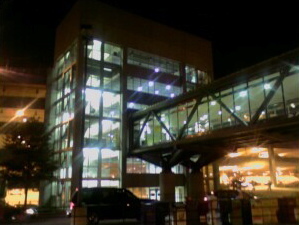 Three hours, one Red Line, one Blue Line, two shuttle buses, and a visit to every station by bus between Crystal City and Springfield, Virginia and we finally made it to the end of the real line. Seems that Metro had a repeat of yesterday’s mysterious shut down with the tracks catching on fire and filling the tunnels full of smoke. Well, that’s what they said – actually, they never did say, we learned that after calling The Brother the Methodist & Family on the cell phone and they told us. We just kept hearing about an “emergency situation” which had a lot of people looking up at the sky (some things are never forgotten). It was daylight when we left, a lovely summer afternoon. But by the time we got to Springfield, darkness had settled over the Metro, in more ways then one. Of course, we took some photos along the way. Having been “unloaded” off at the Pentagon (somehow appropriate), we were smooshed into buses with drivers that had no idea where they were going (“Don’t know!” cried the driver, “Don’t know where we’re going!”). We actually joined a caravan of Metro Buses headed “south” and following a “security” truck with blinking lights. We were packed into the buses, but not sure where we were going. Driver didn’t know either. Weird. We stopped at Crystal City where a riot nearly broke out with angry people who had been stranded outside the Metro having been unloaded but with no shuttle. Kept phone in purse during that melee. 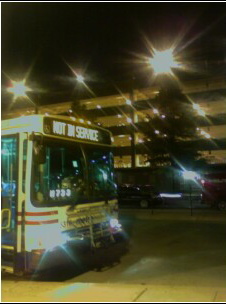 Then our Bus Caravan took off and went to Reagan National Airport, but no one was there. 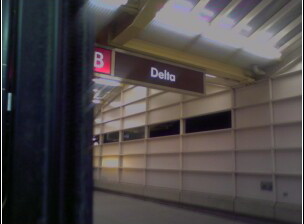 In fact, the airport felt deserted. Weird. We took off for Braddock Road where there was more overflowing crowds and were told to get off at Braddock Road and get on the Metro. But once we did we learned that the Metro was still closed due to the “emergency situation” and there were police – real police with guns and everything, including some with Big Guns – everywhere. The Metro personnel still didn’t know what was going on, but the policeman I found sure did and he was really helpful, cheerful and in charge. Wish I took his picture. 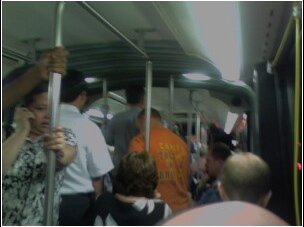 But instead, was loaded on to yet another Metro Bus and told we were headed for “Points South.” New Orleans? 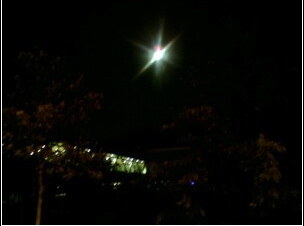 As we arrived at the Springfield Metro the moon was out and shined over the station like the North Star. We were like pilgrims on a journey and in time we made it home. Until tomorrow. Glad you made it safely home. The Post is making the whole thing sound rather ominous.http://www.washingtonpost.com/wp-dyn/content/article/2007/08/27/AR2007082701955.html?hpid%3Dtopnews&sub=ARStay safe BB! Don’t usually think about praying for people’s commutes, but this morning I am. What a fine piece of writing! Glad you got home, glad you wrote. It’s a strange and sometimes wonderful world. Unfortunately, Metro screws up badly two or three times a week these days. Glad you made it home. Your apparent patience is a good example. I wouldn’t have done so well! Did the driver happen to have a bump or scar on his forehead and a story about getting beaned by a harmonica?